Lake Louise is situated in Banff National park and is another good option for your ski holiday in Canada as you have access to four ski resort areas: Lake Louise , Banff Norquay, Sunshine Village and day trips to Kicking Horse onboard the Kicking Horse Powder Express. 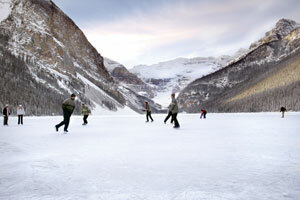 Also, there are many winter tours to choose from out of nearby Banff, some of which pick-up in Lake Louise. When you stay in Lake Louise, your ski lift pass, the Tri-Area ski lift pass, covers the three nearest ski resorts: Lake Louise, Sunshine Village and Banff Norquay INCLUDING the return ski shuttle to and from any of these ski resorts. There are no ski-in/ski-out properties in Lake Louise although the nearest hotels are just 5 minutes onboard the free Lake Louise village shuttle. Lake Louise is about 40 minutes away from Banff and about 2.25 hours to Calgary International Airport and is a is a quiet getaway with a population of about 500 people in the winter time. Located at 1,536 m (5,039 feet), Lake Louise is the highest permanent settlement in Canada (Banff is the highest town). The Lake at Lake Louise, named Lake Louise, is located about 10 minutes drive out of Lake Louise itself and the luxury Fairmont Chateau Lake Louise is located on the shores. The lake freezes over and you can ice skate or just enjoy the spectacular scenery. A romantic getaway or a relaxing retreat, Hollywood stars and heads of state have been known to go to Lake Louise to ski and unwind! There are limited ski accommodations to choose from in Lake Louise due to it's size, but for the ultimate Lake Louise experience, the family friendly Fairmont Chateau Lake Louise would be the place to stay. The ski locations are listed in alphabetical order for your convenience. See what the weather is like in nearby Banff.